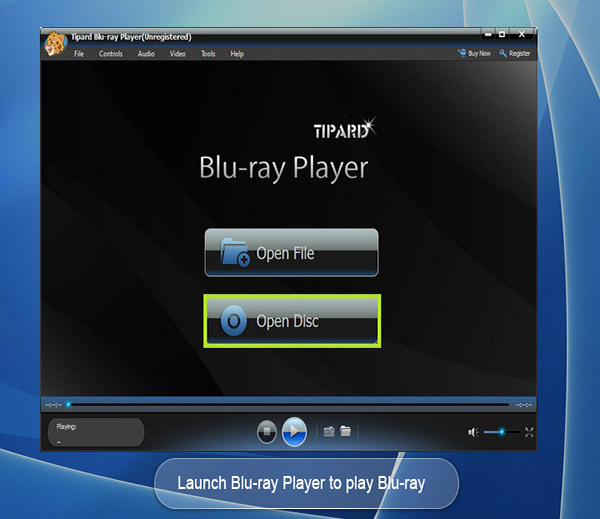 Tipard Blu-ray Player can play Blu-ray file in the mode of Blu-ray disc, Blu-ray folder with high image quality. Meanwhile, it can also support 4K videos and 1080p HD videos. Besides, it allows you to play common videos including MP4, MOV, AVI, M4V, MPEG, MKV, FLV, etc. The magical software also enables you to select your needed audio track and subtitle as well as the video track, subtitle track. Furthermore, this powerful Media Player is highly compatible with windows 10. This professional Blu-ray Disc Player can play Blu-ray files in the mode of Blu-ray disc/ Blu-ray folder with high-quality viewing experience. With the assistance of Blu-ray Player Software, you can play your 4K video like 4K H.265 MP4, 4K H.264 TS, 4K MKV and others with high-quality image. This magical HD Video Player software is able to play 1080p video like HD AVI Video (.avi), HD H.264/MPEG-4 AVC Video (.mp4), HD MKV Video Format (.mkv), HD MOV Video (.mov) and so on. Meanwhile, it can also play the common videos like MP4, MOV, AVI, M4V, MPEG, MKV, FLV, TS etc. This Blu-ray player software also allows you to adjust image and audio effect. You are able to change audio track, audio channel and audio device to get better audio effect. You can also choose video track or subtitle. Furthermore, it also has snapshot function to let you to capture your favorite image. Winyl music player (Popularity: ) : Winyl is a new music player for windows. This is full skinable, small size and minimal use of system resources. Winyl offers great new ways to organize and enjoy all your music. KI Media Player (Popularity: ) : This is an ActionScript 3.0 dynamic FLV player. You can play both older FLV files or newer H.264 videos with latest Flash player installed. Continuous FLV Player (Popularity: ) : Controllable via XML file, you don't require Flash to operate this player. FLV Player H-List AS3 (Popularity: ) : XML driven FLV / H.264 video player with playlist, custom scrolling and autoPlay for Flash CS3 / Flash CS4 and above / ActionScript 3.0 version. XML FLV Player H-List White AS3 (Popularity: ) : XML driven FLV / H.264 video player with playlist, custom scrolling and autoPlay for Flash CS3 / Flash CS4 and above / ActionScript 3.0 version.